Chapters: 1 & 2, 3 & 4, 5 , 6, 7, 8, 9, 10 & 11, 12, 13, 14, 15, 16. When the ground first started shaking, Grace was paralysed with fear. 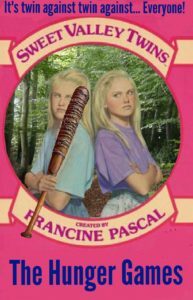 Sweet Valley had had an earthquake before – a very small one – and possibly, it should have had more, since it was later discovered that Sweet Valley was a suburb of LA, but she and the rest of the tributes were just not used to them. She stood there motionless as the fridge toppled forward. Brooke screamed, “EARTHQUAKE!” and around Grace, everyone started running, but it was too late for her. The fridge slammed down to the ground, squashing her flat. A cannon boomed. “Nooooooooo!” Dennis Cookman yelled. “She’s Grace Oliver, not Olivia Davidson!” It was the last thing he said before a fissure opened up in the ground and he fell into it. With great ugly groaning noises, trees fell. Tom McKay was in the path of such a falling tree. His brother, Dylan, tried to save him but tripped over his own feet. Instead he crashed into Tom, and they both fell to the ground, with no time to get up. The older brother died instantly when the falling tree caved his skull in. Tom was pinned beneath it, and slowly suffocated and more trees fell. Above them, the mountain trembled, and a great slab of snow began its descent, starting slowly, but picking up speed. Lois and Lila raced down the slope to the flatter ground. They had been very close to the base of the mountain when the earthquake hit. Lila’s instinct had been to stay put, but Lois had dragged her along, and Lila had followed instinctively, knowing that Lois could be trusted with life-and-death decisions. They found themselves back in the clearing with the cornucopia in the centre. Lila veered toward it, and after a moment Lois followed. Further towards the edge were a whole host of tributes was crossing the field, also heading towards the cornucopia. “What do we do?” Lila gasped. If the ground stopped shaking, surely the other tributes would start fighting. Lois kept running, so Lila followed her. When she reached the cornucopia, instead of getting inside, she ran past it, along the side. She came to a halt and offered Lila a stirrup. When Lila goggled at her for a moment, she said, “Get up!” in a tone loaded with exasperation. Lila did exactly what she was told, and hoisted herself on to the low roof of the cornucopia. Once she was settled, she turned back and offered her hand to Lois, to help her scramble up. “Well, there are a lot of Unicorns down there…” Lila said thoughtfully. Thankfully the shaking finally subsided, and she was able to lessen her death grip on the cornucopia. Lila thought of all the times Jessica had stabbed her in the back – metaphorically, so far – over something as small as a sweater or a poster. “And things are heating up in the arena, Johnny,” Beau said. “As president of the Unicorns, I order you two to get down!” Janet demanded, looking up at Lois and Lila. “Lila! Tell the fatty to get off the roof of the Unicornucopia!” Janet snapped. Lois faltered for a second – she had forgotten for the past few hours that Lila was not just any Unicorn, but the cousin of the president. It wasn’t just mean girl solidarity they shared, it was blood. Lois couldn’t hide the surprised smile that crossed her face on hearing Lila’s response. The three of them ran out of the cornucopia, each armed with swords and knives. Jessica took a run at the cornucopia and tried to climb to the roof. Lila took a step towards her, but Lois got there first. 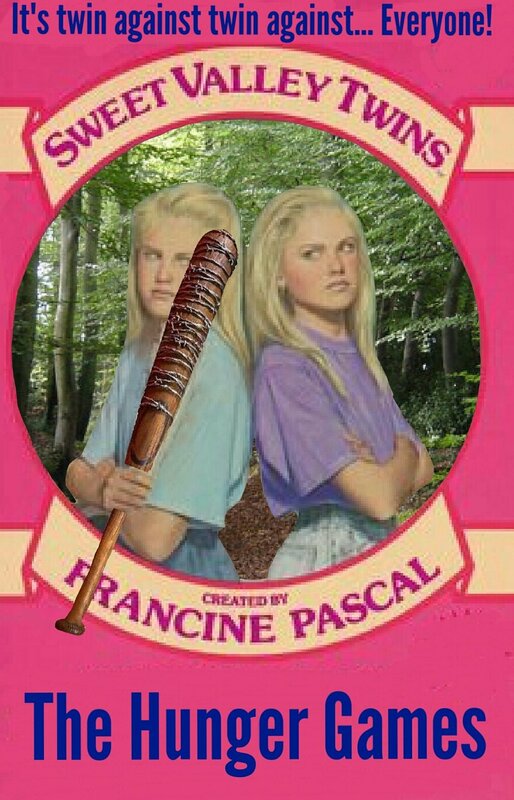 She swung her hockey stick and it connected solidly with Jessica’s head with a hollow thwack. Jessica froze and dropped like a rock. “RETREAT!” Janet cried, and took off without checking if anyone followed her. “Shall we take the cornucopia?” Lila gave her a hopeful smile. Lois tightened her grip on her hockey stick. “Let’s!” Suddenly she heard the sound of rushing water, followed by the groaning and creaking of trees snapping under pressure. “What’s that?” Lila asked in a whisper. A huge wave broke through the tree line, carrying with it fallen trees and rocks. Tributes sped out of the cornucopia, their screams barely audible over the rush of water. Lois had a few moments to holster her hockey stick and grab Lila’s hand before the wave hit them. They were nowhere near high enough. The water hit them like a speeding truck. They were knocked back, dragged along by the powerful current. The water filled Lois’ mouth and nose. Lila’s hand slipped from her grasp.